Some of the links I've provided on the right are mostly the ones I used to plan my own trip. Hopefully by listing them here will save you some time from fishing them from google or other sites. The rest of them are just added for link exchange between other sites related to Japan. The weather in Japan from mid to late March was pleasant in most parts of Japan, only the northern island of Hokkaido proved to be a little too cold for normal clothing. Visiting Japan in November was perfect concerning the weather. There was only one day that was cold and slightly rainy, but otherwise the temperature was around 13-17 celsius and usually the sky was clear. For a Finn like me, it was just the right temperature, although my Japanese friends thought the opposite! Chances are low that a random Japanese person would understand English, so knowing even the simplest Japanese phrases will help a lot when communicating with them, although it's not compulsory. No surprises that understanding English yourself is the minimum requirement, as many announcements and other instructions given to tourists were in English. If you are a friend of food, go to Japan, because they have a serious passion towards it too and there are restaurants in every corner. The Japanese cuisine usually has a winning formula of being tasty and healthy at the same time. When I came back to Finland, I realized how greasy the food actually is around here compared to the Japanese dish. And even if you weren't in the mood for Japanese food, there are lots of other cuisine restaurants to try out. A word of warning though: I had no stomach problems at any stage, but a friend who visited Japan just a few months earlier than me got salmonella from some food. In one other case another guy, who was with the group where my former manager was - see day 13 - got a food poisoning so serious, he was taken to a hospital! Is Japan an expensive country? Well, okay. It's not as seriously expensive as some people love to frighten others, but it certainly is no India. Japan is still rightfully ranked as one of the most expensive countries in the world. So anyone can feel it in their wallets if things get out of control. A typical price for a lunch in a Japanese restaurant was around 900-1200 yen (7,6-10 euros), but while I was in Kyoto I quickly learned to visit convenience stores and bought boxed meals which were priced around 650-750 yen (5,5-6,3 euros). There were also some cheaper restaurants around 650-800 yen (ramen restaurants for instance). Going to fast food restaurants will also save you money, but is it really what you came eat in Japan? Many major stores accept credit cards, but cash is still often the only option in many smaller shops, so don't rely too much in your plastic cards. The use of credit cards is however rapidly increasing in Japan too, so I'm told (and actually noticed myself too). Western or Japanese style accommodation? The accommodation rates especially in Tokyo weren't cheap, but I strongly advise to avoid western style rooms and trying out a ryokan for the real experience. The rates are about the same for business hotels (5500-8000 yen), but the atmosphere is totally different. Of course there are a few super cheap hostels even I considered using (as low as 2880 yen), but at least don't even think about booking into one of those big, sterile hotels, unless you have deep pockets and looking for luxury service that has little to do with Japan. If you plan to move around a lot, pack lightly. I managed with only an ordinary backpack (31 litres) and shoulder bag (9 litres). The backpack had all my clothes and other stuff I could leave in my room. In the shoulder bag I kept more essential things I would need while walking around. Dragging a big suitcase with you will only make traveling less pleasant, trust me. Since I could wash my clothes in the guesthouse cheaply, there was no need to bring a huge underwear pile with me for the two weeks. 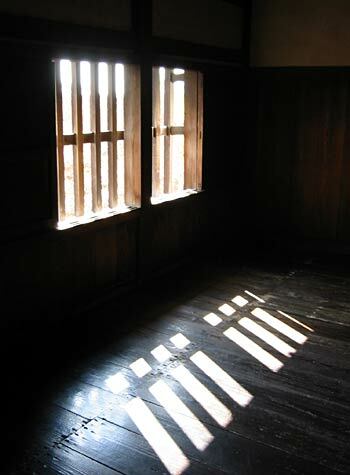 Inside the soldier quarters at Himeji castle. Rakuten Travel (former MyTrip) - A good site to get an idea of the accommodation prices in Japan! It has a good list of different accommodations around Japan and you can even get a discount when you make a reservation through this site! Welcome Inns - Another huge amount of different hotels/ryokans gathered together under one site. Reservation through this site is also possible. Japan City Hotel Association - Another hotel directory, I didn't use it in the end, but here it is anyway. Japan guide - Highly recommended! Possibly the most popular website guide in traveling and living in Japan. Japan Rail Pass - A very good option to travel (fairly) cheaply around Japan by train. Seishun 18 - An interesting alternative for the JR Pass. It's more limited, but the pricing is very reasonable. I haven't used it myself though. Hyperdia - A good website to see what kind of trainlines are available between two locations. Japan National Tourist Organization - Gigantic source of information for tourists (maybe a bit too much to handle). Uppercut Japan - A very cool Japan travelogue absolutely worth checking out. Contains plenty of sweet photos too! Francois Jordaan and Kelly Henderson’s Japan travel diary - Don't miss this one either! Engaging to read and also packed with lots of beautiful photos! Japan-a-radio - having the urge to listen to Japanese pop/anime-music? This is the netstream you're looking for. Japon Japon - This website is made by a group of ordinary Japanese people providing some very nice ideas where to go and see in Japan, as well as explanations to many cultural oddities you encounter out there! PhotoPassJapan - Photos from Japan and various information of the country. A very neat web browser I recommend trying out! 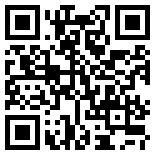 A QR-code containing the site's URL for those who have mobile phone that can read it. visitors since 28th of January 2003.